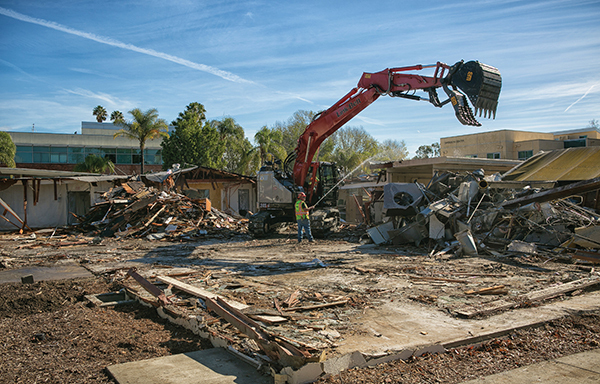 Some 57 years after opening to students, “F” Building, last of the chicken coops, came down in January. Over the years, the converted ranch building had housed not just classes, but a coffee shop, the college chapel, the first services of Holy Trinity Lutheran Church, art studios and offices, Board of Regents meetings and probably more. “F” Building and the smaller, conjoined “A” and “B” buildings stayed upright as long as they did because the art department needed them while waiting for the William Rolland Art Center to open last fall. They had to go as soon as they did to make way for progress in the form of a 47,000-square-foot science center. The three-story building, scheduled for completion by fall 2020, will not replace the 30-year-old Ahmanson Science Center, but connect to it via a skyway.